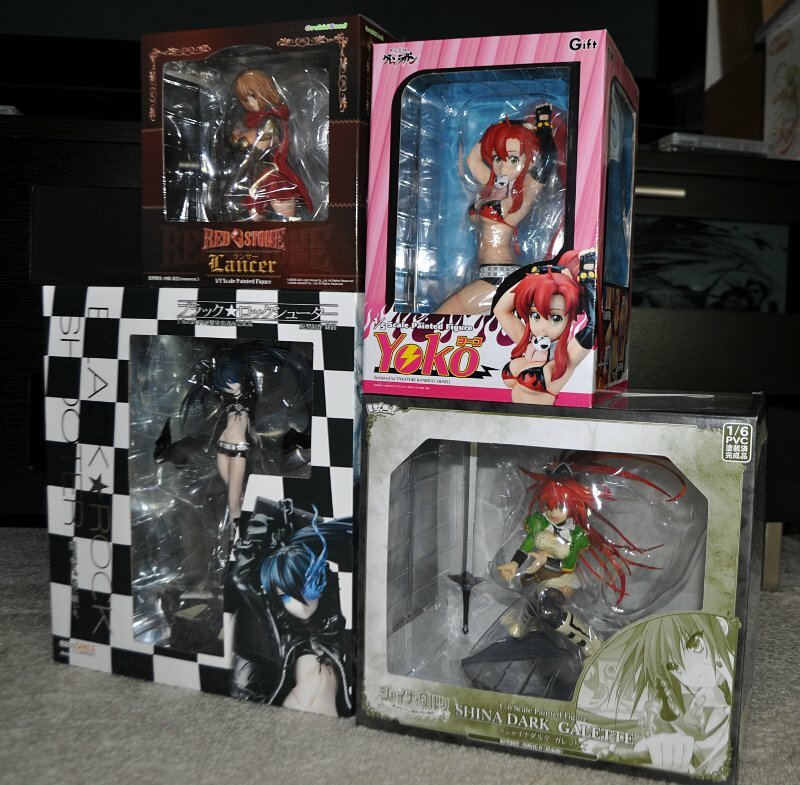 January was a busy month as I used fresh funding from the 2010 budget to pick up some of the higher-priority figures that I missed out on last year (namely, Gift’s 1/5 Yoko and Good Smile Company’s 1/8 Black Rock Shooter). I never wrote about the Yoko figure on this blog, but it was one I was just sure I was going to get when I was first announced and simply never did. Luckily, I found her marked down at Entertainment Earth earlier this month, so I guess waiting on a figure paid off for once. I threw Orchid Seed’s 1/7 Red Stone Lancer figure into the cart alongside Yoko to push my order over the free shipping threshold. It’s a figure that had caught my eye in the Hobby Search RSS feed, but I probably wouldn’t have ordered it on its own. Tentacle Armada’s Lancer review did positively influence the decision somewhat. Obtaining GSC’s Black Rock Shooter figure was far and away my #1 priority going into 2010 and doing so proved to be far more difficult than I had hoped or anticipated. I probably spent an hour or more every day for three weeks scouring the web trying to find her in stock somewhere outside of eBay. I had nearly given up before I chanced upon some stock at Big Bad Toy Store for a reasonable price. Resinya’s 1/6 Galett was a regular preorder from Hobby Search. She was delayed enough from last year that HS was still taking reservations in early 2010. Unfortunately, AmiAmi wasn’t taking any more orders for Galett at the time or I would have probably taken advantage of a slightly better discount from them. I think your picture turned out great! It’s hard to take a picture with all that plastic. I recently bought Lancer, I am waiting for her shipping. I did not pre-order her because I don’t always like Orchid Seed work . But after seeing reviews (especially Tentacle Armada) I wanted to have ^ ^ Nice choice! Black Rock Shooter is a must have. She is really special and original (base, appearance, weapon), I am happy to have her, even if she is not one of my favorite 2009 figures. Yoko is adorable in this version. This is a softer version of the Bounty Hunter Alter. I love this version, great for base mirror. Yoko’s face is really cute. For the latter, I do not know, so I could not say anything lol And I think I said enough xDI recently bought Lancer, I expect to receive. I did not pre-ordered because I do not always work Orchid Seed. But after seeing the reviews (including that of Tentacle Armada) I wanted to have ^ ^ Good choice! Black Rock Shooter is a figure to be a must have. It is really special and original (basic appearance, weapon), I am happy to have, even if not one of my favorite figures of 2009. Yoko is adorable in this version. It has a softer version of the Bounty Hunter Alter. I love this version, great for its pedestal mirror. Yoko’s face is really cute.